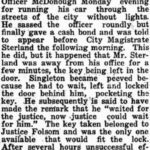 Early stories of the Dickinson Police Department are hard to find, but one officer in particular has caught our attention. 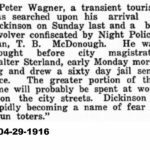 Thanks to microfilm archive from The Dickinson Press, we have learned that DPD once employed a determined, and rather fearsome, nightwatchman in the early 1910s. His name was T.B. 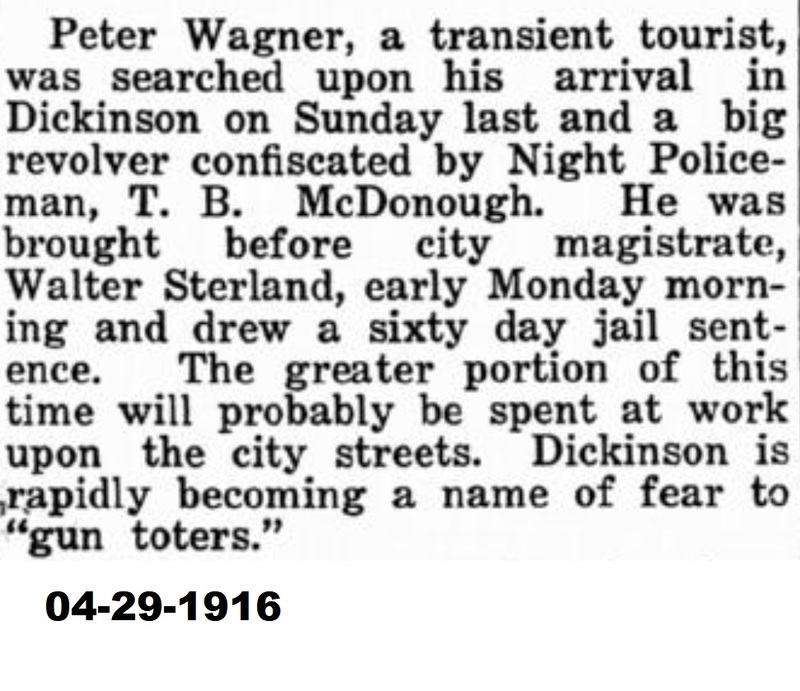 “Thomas” McDonough, and served as nightwatchman for Dickinson from 1914 until the early 1930s. 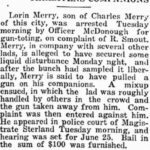 He was an Irishman who once worked on the railroad, and did his policing duties with only one arm as the result of a railroad accident. Continue reading below to learn about this determined peacekeeper. In the early 1900s, Dickinson was an emerging western town on the banks of the Heart River. The railroad helped establish it as an oasis in the prairie, and many began calling it home. 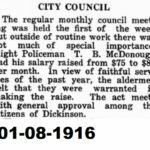 The first official police service was created in 1899 when 34-year-old Robert Craig was elected by citizens as the village marshal. He served until the following year, when citizens formally designated Dickinson a “city”, and hired its first Chief of Police – Joseph McCoul. 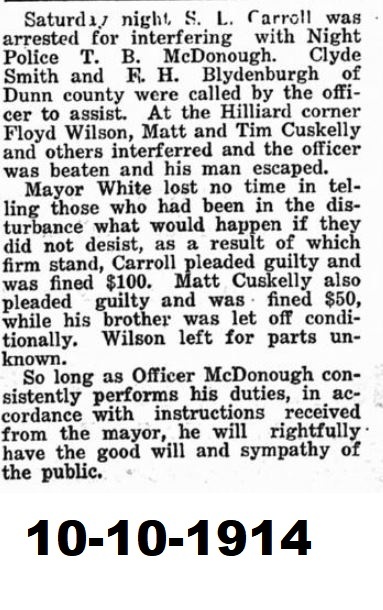 In 1902, John M. Carroll was hired as Chief of Police for the following two years. 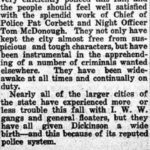 In 1904, Patrick Corbett began a lengthy career as Chief of Police. 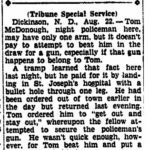 He was a native of Green Bay, WI and was previously employed by the Northern Pacific Railroad. 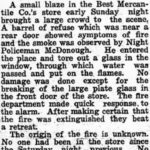 As the town grew, city elders decided to hire a “Nightwatchman” to assist Chief Corbett during the evening hours. 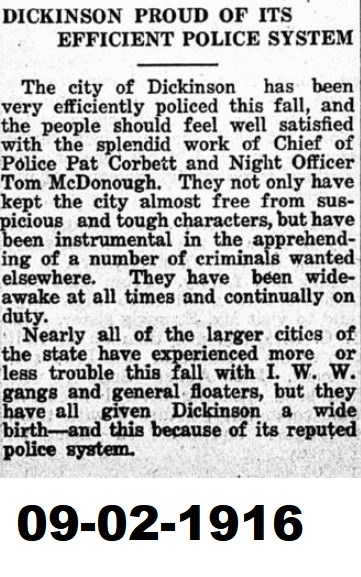 The first Nightwatchmen of this era were Joseph P. Carroll and Ole Tollefson. 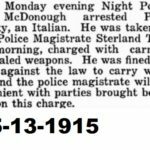 Then on September 12th, 1914, T.B. 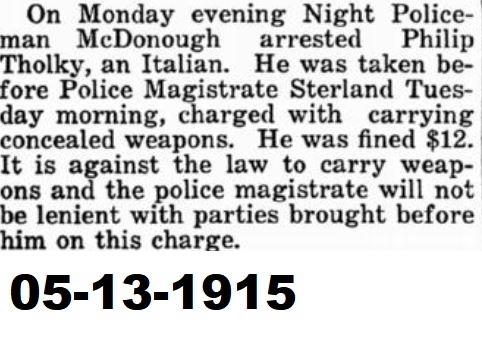 McDonough began his employment as Dickinson’s sole Nightwatchman. 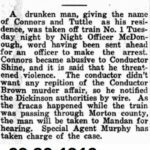 He was a former railroad worker like Chief Corbett. At 43 years of age and only having one arm, he quickly made a name for himself. 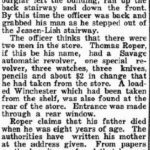 Some called him rather fearsome, and he did not hesitate to get into a scrap, into a foot pursuit, or even into a gunfight. 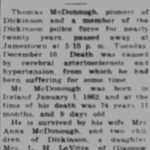 Thomas Bernard McDonough, was born in Ireland in 1871. 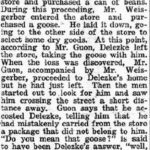 He immigrated to the United States in 1885 and ultimately settled in North Dakota. 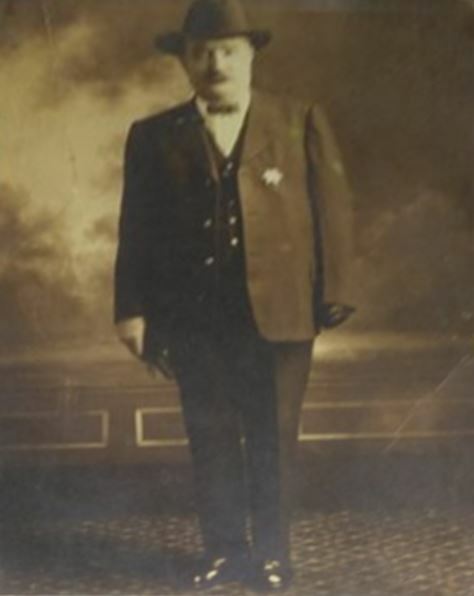 He married his first wife, Mary, in 1897, and they later had a child together. 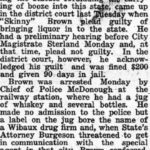 He was first employed by the Northern Pacific Railroad, and was in charge of the Allerd section near Glendive, MT. 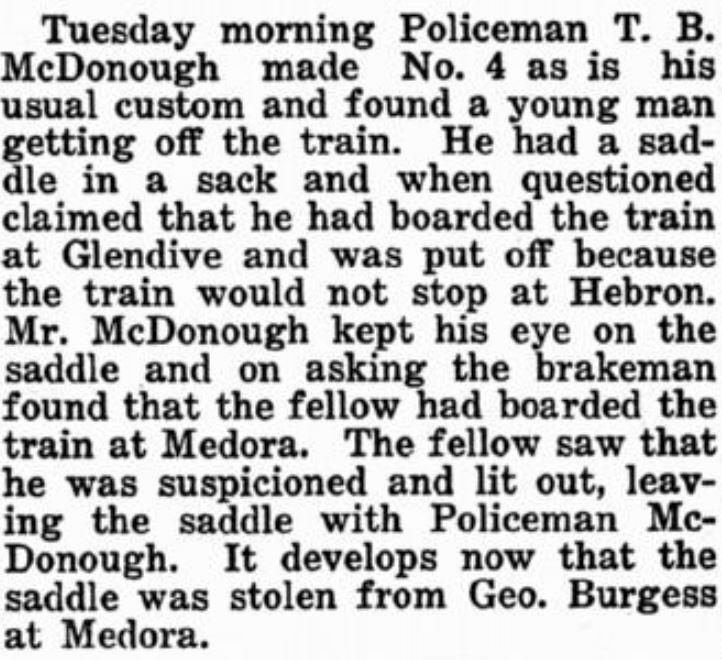 One fateful April day in 1893, 22 year-old McDonough was in the process of clearing an ice gorge that had formed near a rail bridge over the Glendive Creek. 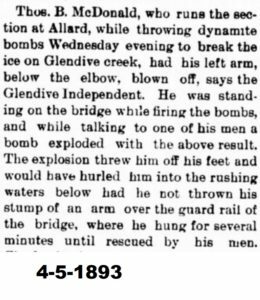 Back in the day, ice jams were commonly cleared through the use of dynamite. 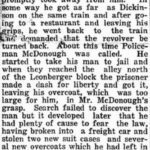 McDonough had been throwing several sticks of dynamite at the ice while standing on the bridge. A co-worker distracted him in the process. 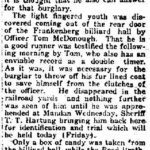 While talking to him, a stick of dynamite McDonough was holding lit off, blowing McDonough’s left arm off below the elbow and throwing him over the side of the bridge. 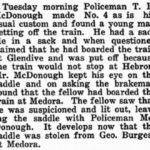 McDonough was able to grab onto a guard railing with his injured arm, and clung onto life for several minutes until stunned co-workers could lift him back up. 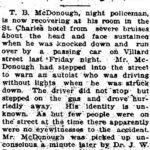 The news article appears to the left, but incorrectly identifies McDonough as “McDonald”. 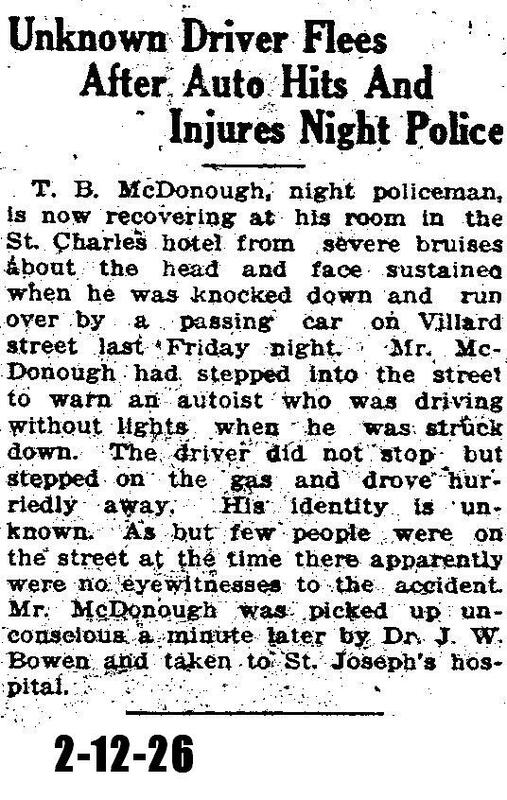 McDonough then appears to have traveled away from Dickinson in 1909 while his family stayed behind. 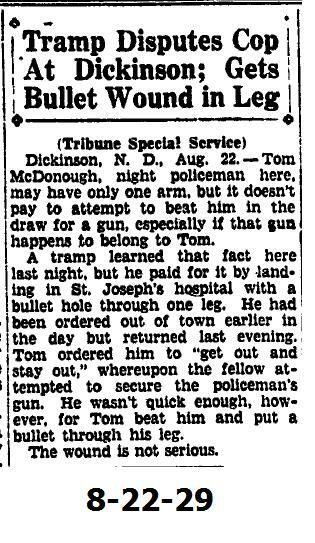 He continued to work for Northern Pacific in Nevada, but had a liking to the prairie of North Dakota. 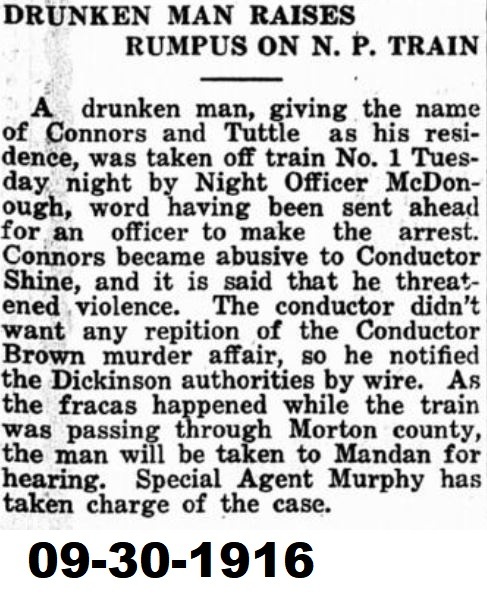 He ultimately returned to Dickinson in 1914. It is presumed he met with Chief of Police Patrick Corbett, who was also a former Northern Pacific employee himself, and inquired about employment. 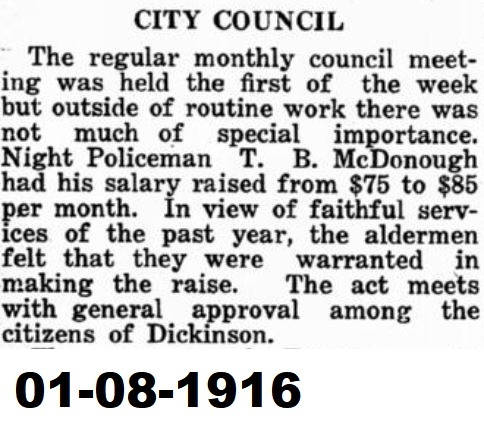 McDonough was then hired by the city on September 12th, 1914. The adventure begins. 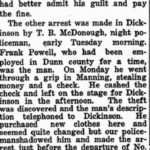 Crime in Dickinson in the early 1900s was somewhat similar to what it is today; thefts, speeding motorists, vagrant complaints. 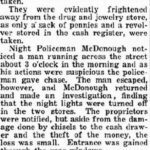 Several articles from The Dickinson Press during this time period frequently mention Nightwatchman McDonough and his determination to keep the streets of Dickinson safe. 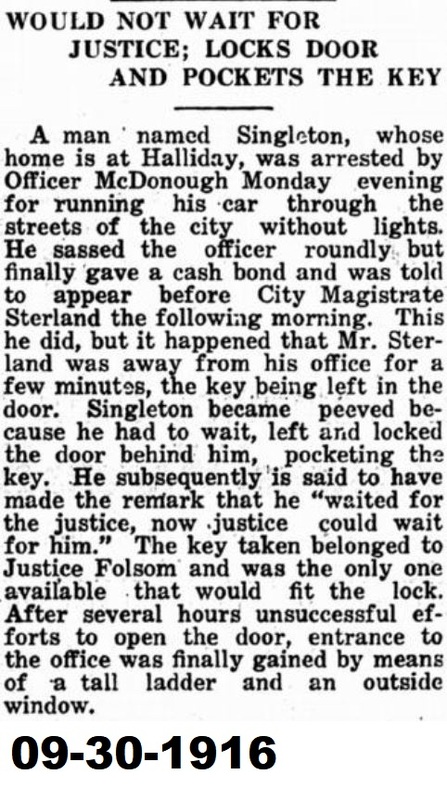 Only a month into his job, McDonough was roughed-up by several individuals while attempting to make an arrest. 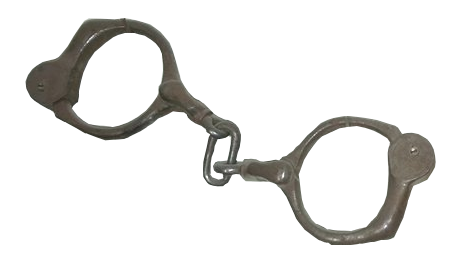 His suspect fled, but all three who interfered with the arrest were later located and fined. 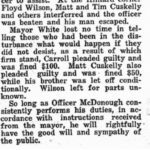 McDonough was assured that if he continued to work diligently, he would have the good graces and backing of the public. This seems to have set the tone for McDonough’s career. 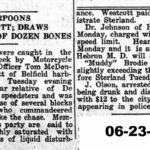 A collection of articles from The Dickinson Press are located below. 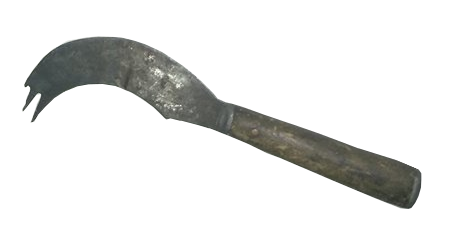 T.B. 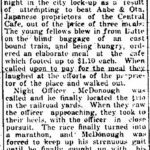 McDonough continued to work diligently as Nightwatchman into his Golden Years. 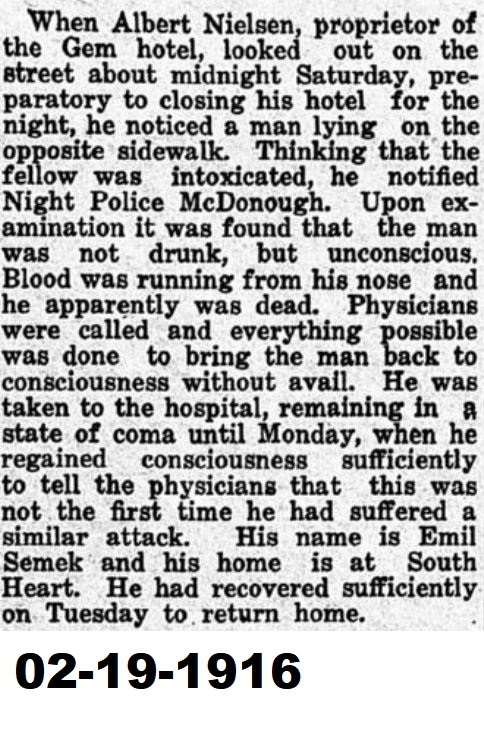 His wife, Mary, died in 1921 after several bouts of illness. 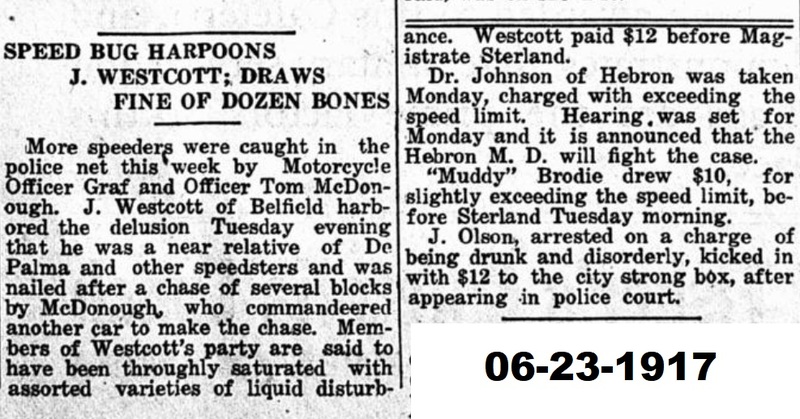 McDonough did not remain a bachelor long, and married his second wife, Anna (Springer) in May 1926. They had two children together. 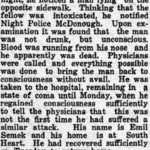 McDonough’s health also continued to decline, and he died on December 10th, 1935 at the age of 64. Upon researching burial records, we learned that McDonough is buried at St. Patrick’s Cemetery in Dickinson. 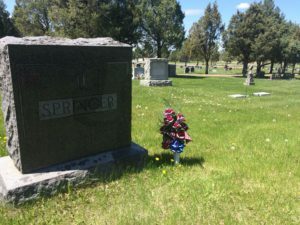 His lot is unmarked, but is adjacent to a marker labeled “Springer”. The Springer plot is occupied by his wife’s (Anna) sister, mother, and father; eternally buried next to his in-laws! 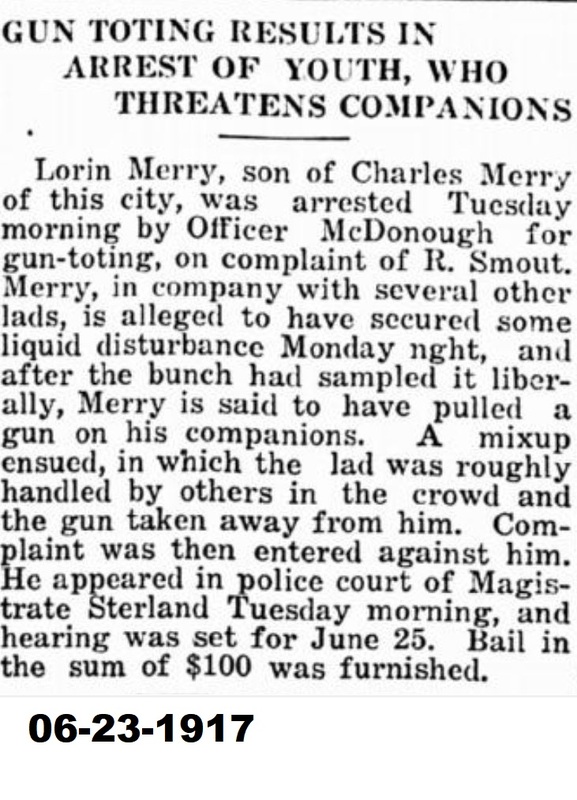 His lot is also a few sections away from John Carroll, who was the second Chief of Police in Dickinson. McDonough’s first wife, Mary, is also buried at St. Patrick’s Cemetery. 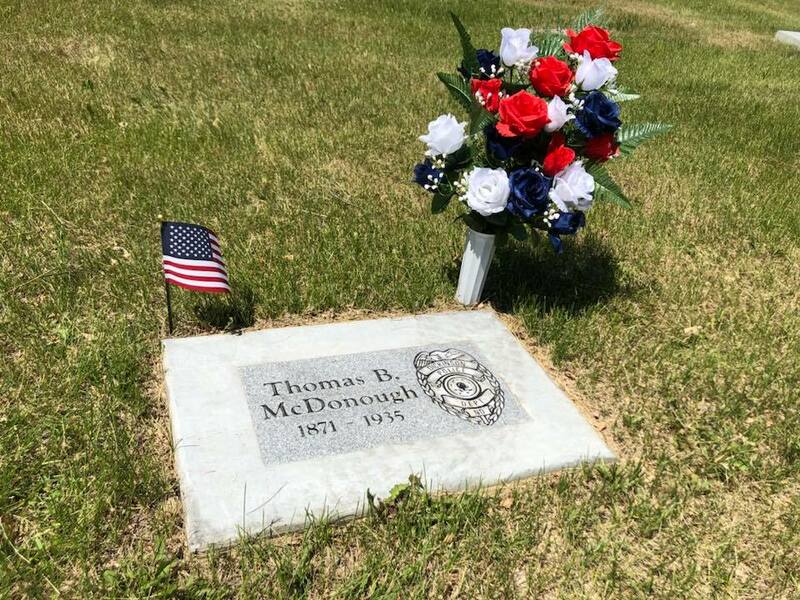 The Dickinson Police Association voted in the summer of 2017 to “adopt” McDonough’s gravesite and placed a memorial marker at his location. History may have seemed to forgot this hard-working Irishman, and the DPA and the DPD intend to keep his memory alive for future generations. 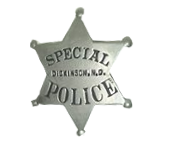 We hoped you enjoyed this history blog about one of Dickinson’s once-unknown, but dedicated, keeper of the peace.